So, the past couple months have been a whirlwind of excitement, turmoil, and an incredible learning experience. Let me recap. Luckily, like a lot of my friends & family figured, jumping back into bedside nursing truly was like riding a bike. Besides a few minor hospital policy changes, or minor unit workflow changes, or a change in where something is located, I picked up everything within a shift or two. Our new software change, in my opinion, has made wondrous incredible changes on the nursing frontline. This makes the geek in me extremely excited. The system prompts you to complete all your necessary work that you still have left to complete for a patient, and it is patient individualized, which means not every patient has the same "To-Do" list! We also get alerted if our patient is deteriorating by the system actually watching our patient's vital signs and observing trends. Not just that but there are may workflow changes that have been improved that are now much more efficient. No more double-charting. No more losing charting. No more downtime. There are so many analytics and reports viewable for our patients that it is incredible, it really makes looking at the patients "whole picture" much easier and user-friendly. Communicating with doctors is more efficient, nurse friendly and faster. Reading progress notes from clinicians is no longer a chore or a handwriting-analysis exercise. All notes from every health care clinician or provider including Doctors, Nurses, Therapists, Case Management, etc., are all typed into this software, and of course readable! This way nurses can better understand (and read) the patients actual plan of care and case. There is nothing I don't like about it! I can confidently say that it has made me a better nurse 100%. Also, with this new change we also were able to adapt devices that have this software loaded onto a small device very similar to an i-phone where nurses and aides can take this from to room to room and have all of their patients information loaded in, and they can chart intakes & outputs, vital signs, complete blood work AND even document medications right from this little device. This also makes the nursing workflow incredibly easier and more efficient. This device uploads in real time and no docking required, unless to charge! But even though I find myself becoming a better nurse, I find myself feeling burnt out still from the politics of healthcare and Med Surg nursing. I am ready to move on and am so happy to accept a new position of a Clinical Informatics Analyst starting in 2 weeks! In this job I will be on a small team that analyzes how clinicians and IT work together to improve healthcare and technology. We will improve documentation, fix issues or build workflows, innovate new ideas, make new processes, etc. We are the bridge between IT (non healthcare personnel and nursing). This is super exciting for me because I have been raised on computers. My father comes from a long career history of working intensely with computers and has taught his daughter well. I also probably inherited some genes of being very interested in technology. I am always interested in the newest gadgets, how they work and more importantly, how they can improve human life. So now I will be looking at and working with healthcare gadgets, how they work and how they can improve patient's lives! So, as you can see- many changes coming in my life & career. So I want to take a moment to reflect back on my bedside nursing experiences and what I expect for the future. Needless to say, I survived but not a day went by where I felt like it was easy. It was always challenging and kept me intrigued. But my home life started to wear away as this increased stress load starting eating away at me. I would lie awake at night and wonder if I did something wrong, if I charted everything okay, did I waste every med? Could I have saved that patient? Did I miss something? I started dreading going in to work and my headaches and nausea incidences picked up immensely. I can't even count the amount of times I have been in a shift and thought, "If I can make it through this shift, It will be a miracle. I will be so thankful to be back home and hide under my covers." Yes, Its true. And I'm sure every single nurse that you know or that reads this knows exactly what I'm talking about. Over the past 4.5 years of nursing, I picked up a lot of skills and I consider myself a mixture of Proficiency and Expert in Patricia Benner's Novice to Expert Nursing Model. However I always was self conscious and thought it to be a weakness of mine that I never really developed a special skill. I was never the "best IV stick" on the floor. Or the "best charge nurse". Or the "best wound care person" ( i never really grasped wound care), or the best person to know X, Y, Z. I rather considered myself a jack of all trades. Or should I say a Jack of all nurses? I felt like even though I never really mastered one skill to its maximum, my "skill" was that I knew a little bit about everything. I had gotten myself involved in a lot of different committees and PI projects and let me tell you, network is KEY to strengthening your career AND your knowledge base. I was always interested in learning and would read nursing books galore and take CE credit courses on my own time or attend nursing conferences. So i knew a lot but mastered none. I always considered this to be a weakness. I always thought to myself, how can I have been through almost 5 years of nursing and I'm still not absolutely great at putting in IVs? How come I never memorize what ABG results mean?? And more. But then I realized that my skill in having multiple trade skills was my super skill! I had the uncanny ability to remember patients information, to organize their care and to stand up for my patient. I had good judgement. I studied their plan of care by reading doctors note after doctors note until I understood everything about the patient. I was able to look at the patient's whole picture and situation and I would honestly take that learned skill over putting in the world's best IV any day. I think this skill has gotten me to exactly where I am today, as I have always had the passion to improve care for patients. Ever since my first day in nursing, I have always thought, "Why are we doing it this way?" I have always thought of imaginary new devices that could be invented to make nurses jobs easier, or new workflows. I have always been able to think out of the box. I know enough to understand the "textbook rules", but have enough judgement to throw most of that away and do whats actually right for the individual patient. When A, B, and C don't work, lets figure out what else will work for the patient. That was my super skill and thats why I think I will do well in informatics. Part of me is also terrified to leave the bedside. This time its not temporary, its permanent. I scare myself that I'm only 27 and I'm stepping away from the bedside, something a lot of nurses don't do until they are a lot older or have more experience. I want to stay current in what is going on in nursing and want to maintain my clinical skills. I don't want to get so involved in the IT world that I don't feel like a nurse anymore. I don't want to forget what it was like, so that I can remember how to make it better. I don't predict however that this will be the end of my bedside career. If I ever do return, I don't think I can ever realistically return to bedside Med Surg Nursing. It's simply not an option for my soul & heart anymore. If I do return, I am interested in three pathways that actually have nothing to do with each other. Either the NICU, Hospice Nursing, or Emergency or ICU nursing. So maybe that will be where I end up one day. I am not the type of person to stay in one position for forever, I am adaptable, a hard worker and always intend to move up or change positions to learn more or to try something new. Whew! I talked about a lot. Sorry. My brain had a lot to say. I am very excited. If you read that all, you are a true fan and a friend of mine. Like I said when I "came back" recently to blogging, I am mostly writing for me. I want to document my endeavors in nursing so I can look back on this in 20 years and see where I was in my career. If you like it and get something out of it, then that is absolutely fabulous! I want to help as many nurses succeed in their career as I can. So I have a ton of homework to do, which makes me that much better of a blog writer! Hah. No really though, I write better when I'm avoiding doing something else. And I have a good excuse anyway, because this topic has been on my mind for about a month, clawing to get out. Actually this may even count towards homework because I'm doing research on this for school, so boo yah! Let me give you the first scenario I have, to slowly dip ya'll into my mindset here. One month ago, I was assisting/as needed/general help down in our ICU department. After being there for a few, I quickly learned about a case down there. He was an 84 year old gentleman, who had been a code blue (he stopped breathing and no pulse) while on a Med/Surg Floor. He was a "Full Code" at the time, which means we do everything in our possible power to bring a patient back to the living world. We had brought him back to life, and any patient that goes through this automatically gets transferred to the ICU afterwards, no questions asked. There is never a case where we thump on someones chest and shock them and bring them back to life, and then are like, hey- want some apple juice? You seem fine to me! No. So on he transferred to the ICU, hence where I met up with his case. I heard the ICU nurses talking, their "nursing spidey sense" that I know all too well was all in effect, as they all had a feeling this man was going to die that night again. However, this time his family had decided that this time he would not be a "Full Code". What happens if you aren't a Full Code? You have other options. But in my opinion (and I'll explain this more later) the best option is to pass away peacefully with lots of morphine and silence, and someone holding my hand so I know I'm not alone. When the ICU nurses noticed his heart rate start to slow down, we knew impending death was soon. Our patient was trying to cross that line and was getting closer. We all agreed to go be with him, as his family had left for the night thinking he would make it overnight and they would say goodbye in the morning. Obviously that wasn't the case. We all stood by him, holding his hand, as we watched at his bedside his alarms going off, his heart rate slowing down dramatically, his breathing erratic. Me, being non-immune to all the alarms in the ICU, only heard the sound of the ventilator (breathing machine) pumping artificial breaths into this man, trying to keep him alive despite higher powers at play. As sad as this case may seem (if you think that was sad, get your tissues out now), it actually wasn't as bad as it could have been. The reason this man's family didn't want him to be a "full code" in case he passed away again was because they had already seen him code the first time. The general public (hence his family) don't actually know what we mean when we say "Full Code". Doctors ask when you get admitted, usually regardless of your condition, "In the event of your pulse stops or your lungs stop breathing, do you want us to do everything in our power to bring you back?" Given that sentence, that sounds lovely, why yes! Bring me back! At the snap of your finger, or with your magical powerful wand. Bring my loved one back! However, what most doctors fail to mention is what a Full code really entails. It's not quick. It's not quiet. It's not painless. And its certainly not magical. For my non-medical readers, let me give you a quick low-down on what happens during a full code on a typical case. Please don't read this paragraph if you get queasy! But I do intend to paint an accurate picture. We automatically begin CPR. You all have seen CPR on TV at some point I'm sure, and the patient always wakes back up within a minute or two. But have you ever seen CPR in real life? If so, you know that the recommended depth of compressions is 2-2.4" into your chest. Imagine someone right now pushing your ribs in 2", without you backing up. Pushing in 2" while you are laying down, helpless. Yes, ribs are usually broken. We also are doing this at 100 pumps per minute, no less. And we don't stop until the patient does return to life or a family member calls this effort off, or the doctor deems it medically impossible if the code has gone on too long. And that's not all. When we start doing compressions, someone is operating an external airway with whats called an "Ambu" bag, to deliver you 100% oxygen. This is only until we can complete something called "Intubation" where we insert a tube through your mouth and down your throat and into your lungs so that we can hook you up to a ventilator to do the breathing for you. Oh and that's not all. If you have had anything to eat or drink within the last couple hours, what do you think is going to happen when we are jumping up and down on your chest? Yeah, it's going to come back up! When you're lying on your back unconscious! And we will suction as much out as possible, but it still will be everywhere. So, that all being said, do you think if Doctors really painted that picture when we asked patients if they want to be a full code, do you think as many patients or patients family members would still want to be a full code? I don't think so. Now I've witnessed hundreds of doctors have this very conversation, and some paint a pretty picture and some don't. However, very very few actually go into detail about what really happens. Why not? Because it seems harsh! It is harsh! That paragraph above is horrible if you imagine it happening to you or your family member. If you get admitted with a broken arm, we still ask you if you want to be a full code. We ask everybody, because you never know what could happen. Life works in mysterious ways. Just a few months ago I remember a case of a man admitted with a UTI (urinary tract infection) but otherwise completely OK. Then BAM, had a massive heart attack while on our floor and coded. You never know. So if you get admitted with a broken arm or a UTI, and here comes the doctor asking if you want us to save your life if you die? You're automatically going to be like WTF, I have a broken bone- are you not telling me something? Am I dying? If I'm not, why are you asking me this? Or if the patient does understand the fact that this question is asked of everyone regardless of diagnosis or age, then many patients think that we are "giving up" or "won't treat" the patients condition if they agree to not be a full code. Their logic may be, "well if they aren't going to save my life then whats the point of even being here, or being treated?" Well that simply is completely logical. It is a reasonable way of thinking, but I assure you it is not true. I can say with complete and utter 100% confidence that I have witnessed on so many cases, where the doctors and nurses do so much to help a patient feel better or improve their condition, even if the case is eventually terminal. I promise you, healthcare will never ignore you or not treat you for your current condition as much as possible just because you agree not to be a Full Code if death occurs. Now don't get me wrong at all, some people should be a Full Code! Absolutely! Let's say you do come in with that broken arm, or are having a heart attack, or a UTI, or whatever- but you are otherwise healthy- You live a happy, meaningful life- You should be a Full Code! You also have the best chance to also survive a full code as your body is healthy besides what is going on now. If we catch your heart stop beating immediately, chances are we will definitely get it back to beating within a very short time frame, especially if your body is remotely healthy. What irks me however is when doctors are unrealistic with those that aren't healthy. Those that come in with terminal cancer. Or have advanced Alzheimer's disease or dementia, or have any end-stage disease (heart disease, kidney disease, lung disease, etc.) Doctor's hit you with what I call a "Double-Positive Whammy", they make you think that death isn't impending soon from your disease, but just in case it is- If you are a full code, we will do everything in our power to bring you back and it will probably be successful! No. I have been doing a lot of thinking on this and a lot of reflection within myself, my beliefs, my patients, my nursing practice.... and I still firmly believe in what I'm what about to say. I know a lot of people may disagree with me, and I encourage that- Everyone is entitled to their own opinions, especially with ethically situations such as these. I'm entitled to your opinion as are you. I don't care if you are 18, or if you are 30, 40, 60 or 100. If you have a disease that is slowly killing you, I see no reason to hold off the inevitable. Now that is a FINE LINE. For example, let's say a healthy person gets diagnosed with cancer. I completely support the notion of undergoing treatment (surgery, chemo, radiation, etc.) I mean, you were healthy before! But what about after 10 years of treatment after treatment? How is your quality of life doing? Chances are, the patient themself already has a different opinion about their own end-of-life than their family or loved ones do. What I intend to make a point of here, is that regardless of age, if an individual either has a terminal disease, more than three major comorbidities (any major chronic disease that takes a significant toll on your quality of life), or are experiencing a poor quality of life (not eating, not happy, unable to do favorite activities, hobbies, cognitively impaired, etc) then in my honest opinion, they at least deserve the honest picture of what a full code truly means, and then they can decide. I'm not saying it should be mandated that these cases should automatically be a no-code based on an algorithm, that would be unethical. But they at least deserve the honest truth about the decision. The rest is up to them. The last scenario I would like to share with you (if you are still reading) is a case that really pushed my feelings over the edge. Recently my unit took care of a very sweet elderly lady of the age of 96. She had multiple medical problems and was admitted with anemia (low blood count) due to gastrointestinal bleeding. She was with us for awhile with no events. Sent home. Family brought her right back due to intense abdominal pain. Again she stayed with us for awhile. Her blood counts kept dropping, there was no way to keep up with it. Her internal bleeding was too severe. Meanwhile, she was absolutely miserable- She couldn't urinate on her own- leading to us straight-cathing her every couple of hours- she was in immeasurable amounts of abdominal pain, and she had a very poor appetite. And yet her daughter was her POA (Power of Attorney) and watched over everything regarding her moms care. And yep, You guessed it! This patient was made a Full Code. Decided by whom? You guessed it! The daughter. One night, her vital signs started significantly dropping. The bleeding too severe for her body to compensate with. It came time that using our own nursing judgement, being that she was a Full Code, with the vital signs the way they were- she was quickly knocking down deaths door. If she was going to remain a Full code, we needed to treat her like a Full Code and get her to the ICU before she codes, that way she gets more intensive treatment to prevent that from happening. So we called what is known is as an RRT (Rapid Response Team) which is sort of like a pre-code. The patient isn't coding yet, but could be on their way soon if we don't fix the problem now. So of course during a RRT, a lot of healthcare personnel show up. Multiple RNs, Med Surg and ICU, 1-2 Respiratory therapists, a doctor or PA/NP, nursing supervisor, etc. We always draw bloodwork, usually put in a new IV. There's people everywhere and the bright lights are on in your face. Its like a code except you are awake and aware for it all. Well, this sweet lady is terrified and is screaming in pain. She's also crying, "Please, no." "Don't do this to me." "Let me die." "I want to die." "Don't do this." "stop this". And yet, because her daughter has the POA (who happened to be in the room watching this whole scenario unfold), the daughter has the decision on the code status. And despite her mom crying in pain and agony, the daughter demanded we do everything possible to save her. Maybe, maybe not- but if the daughter really knew what a code really meant, would she come to her senses and not want that for her mom? If a loved one of mine were in the situation, don't get me wrong- Its awful. It's incredibly sad & frightening. But If i knew that my loved ones medical condition had made their life quality so horrible and they didn't want to live anymore, or they were in immense amounts of pain, I would never prolong the inevitable. I would of course want to treat them and care for them, but if the higher powers decide its their turn to go, then all I want for them is to not be alone and to not be in pain as they make that journey. I think that's the best gift I can give them as their own loved one. Thank you for reading. I know its a hard topic, and a never-ending one. A very ethical one, and I know a lot of people will disagree with me. Chances are, not a lot of nurses will disagree with me, however. Because we see this every day. We see cases like these two every day. We are immune to the sadness, the awfulness of it all. We are trained to do what we have to do. If someone wants to be a full code, then so be it, we will do everything we can to save your life. Just be sure its really what you want for yourself or your family member. Well, as promised- I have returned for a second time in under a week! That's already an accomplishment! Also, as promised- I want to tell you all about how our Go-Live went. Now remember I'm not naming my hospital network or the system we went live with, but refer to my last post for a clue... Now anyway, the system is amazing, just like I knew it would be. It is fascinating having had the privilege of learning the system since September and teaching it to others, but so far only having seen it with fake patients. I was so eager just to get to see it work for real! As we drew closer and closer to the Go-Live Flipswitch, my coworkers fear and anxiety levels rose but my excitement drew higher. Getting to work with it all weekend after that moment has been fantastic and very eye-opening. I remember having had "play time" on one of my last days of my own training where we were allowed to just play around and practice anything so that we felt completely ready to help once we went-live. I practiced and practiced and I thought surely, I know everything know- What other situation could arise that I don't know how to do? Well, I should have slapped myself right there because the rest of the weekend I was "go-Live support" which entailed me running around the hospital ( I literally ran up and down some stairs a few occasions) in order to help all three of our units and the ICU, and handle any problems that were arising. Needless to say, my "to-do" list was about 20 items long and it kept me busy all 12 hours of my shift. I would cross one thing off and be on my way to handle another and then on that route another problem would occur. So, point of the story is I thought I knew how to handle everything but then when real patients are in with unique individual situations and the patients aren't fake, certain charting queries come up and there needs to be a firm solution on how to handle that. I was put on the spot many times and had to rack my brain at 3 am in order to get a solution. It is interesting watching people learn. Like I said before, I had the opportunity all fall to teach fellow nurses, PCAs, and Nurse managers on how to use the system. We faced a lot of kickback, frustration, tears, confusion, etc. And although I saw a lot of frustration with the Go-Live as well, overall these nurses knew that frustration was not going to help their patient and that if they just sit back and let us teach them how to handle the problem, they would go a lot further. Therefore a lot more health care personnel were a lot more open to learning this time around since we were working with real patients, real time, real problems. It was also delightful getting a lot more "Ah-ha!" moments from our users. It is a known fact that users always learn faster when emerged inside of a real situation. We can only teach these users so much and get them to remember when we are working with "John Playdough" instead of a real patient, and when we are teaching 2-3 months away from the Go-Live day. And yet when these users are using it every second of their shift because they have to for their real patients, they pick it up much faster. Just like learning a language- You learn French much better stuck in the middle of France than you do in a classroom. Overall this whole experience so far has reinforced within my own self that I love informatics, I love teaching people and I still love healthcare. I can't wait to grow inside this field and to accomplish more tasks. I love being in charge of projects around the hospital and reporting to and talking directly to high-up administration (literally had multiple conversations with the vice president of my hospital over the weekend!) not because of a power trip- but because I like being trusted and knowing that people believe I can accomplish difficult tasks. Hi. It's me. I'm writing again. I'm here. I've been thinking about this blog for a very long time. It started in 2009 and around 2013 I lost my drive, my writing mojo. All together. 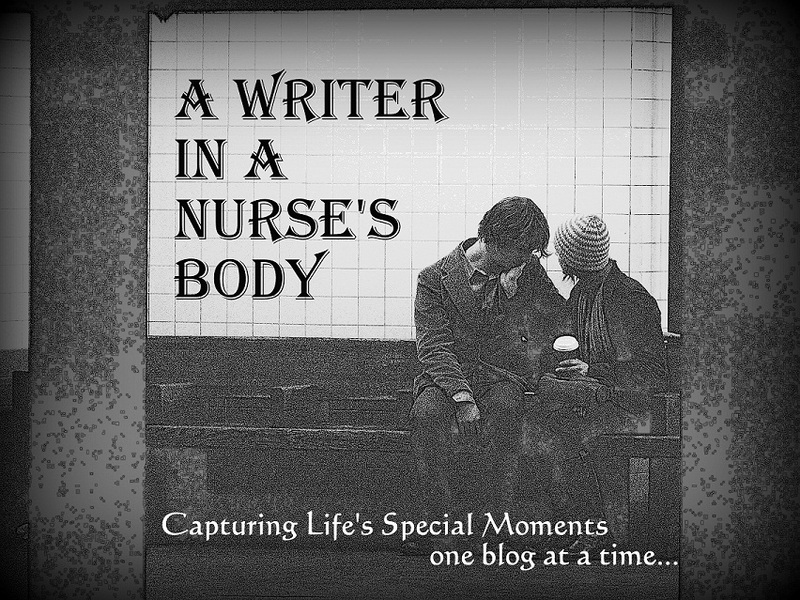 I tried so hard to keep it all together and as my nursing career was starting and going strong I began to lose the writers part of my brain. I began to feel burnt out as a nurse after my 3rd year and it started to consume my entire life, my entire brain. It made me not want to write anymore. I didn't feel like I had anything to say. For awhile I tried making 1-2 posts a year but that just made me feel even worse. Even more guilty. I guess part of me didn't know what to say and the other part of me didn't want to let my audience down. I worked so hard bringing this blog to where it was, gained so many followers and internet attention as It was being born- and then during my block- sometimes I would think of a post and instead of just going with it like I used to- Who cared what people thought?- I would filter it and ask myself, is this good enough for my blog? And usually I'd talk myself out of it or then find myself too busy to log on and try so the thought wouldn't come to fruition. The evil cycle continued. However lately, my life has taken many strange and exciting turns. It has been a rollercoaster, to say the least. Like I said, I've been thinking about this blog and have desired to start it back up for quite some time now. But again thought to myself, do I have anything to say? But now I have realized within myself- the same self that started this back in 2009 that who cares what people think? This is my blog, my writing, my self. Lately I've really started paying attention to myself and reacting and standing up for myself and whats right. So from now on I will write what comes to mind and if it bores you then great, find a list to the right hand side of my page with other fantastic blogs you should go read. I need this. I need this blog now to be an open space for me. So where is my life now? Where is my career? In recent exciting news, I have gotten married! Yeah! Crazy. I married a wonderful gentleman back in October. To say the least, it's been an incredible but very busy fall! I thank fates and heaven every day for my husband and this wonderful man, even though i'm pretty sure he doesn't even know how thankful I am for him every day. I try so hard to be a "good wife" but its not in my genetic code to be very wifely. Once in awhile I pull through for him though. ;) He's so patient with me, takes care of me, encourages me, inspires me, questions me in a good way, watches out for me, protects me, and loves me so much. Just the other day I was explaining to someone else that found them self in a rather new relationship- the friend asked me how I knew this man was the one- I said because we can read each other's minds. Although that sounds telepathic and futuristic- Its true! We can't actually, but we almost always know what the other is thinking. We haven't been able to take a honeymoon however, much to our dismay. Why? That leads me to my next exciting news. My career took an exciting change for the better in August. The Hospital Network I work for has recently decided to adapt a new electronic health record system. For privacy purposes, I won't outwardly say which one, but if you know anything about health informatics and what system is currently sweeping the entire nation- you can probably guess which one. In August I was selected to come on to a team of trainers to teach all the nurses and care assistants in my entire network on how to use this system before it goes-live. So even though I had spent the last four years on the nursing unit at the patients bedside, I decided it was time for a "break" from the bedside and to follow my heart into healthcare informatics. Although I had never really been a trainer or teacher of any kind before August, I dove right in and for the last few months have been teaching nurses! My mom is a sixth grade teacher. Growing up watching what she did every day, I didn't think I had it in me-the strength to do what she did. I admired her but didn't think I ever could do it. But, it was what I faced at the time so I jumped right in and started teaching! I soon found out after a few bumps and practice runs that I actually loved to teach! Sure I had a ton of challenges and challenging people (turns out teaching adults is very hard! ), but that feeling of sharing your own wealth of knowledge and seeing other people "get it", is very rewarding. I even had a student tell me I was the best teacher he has ever had, including nursing school, and grad school. Go figure! I knew I was good at it and ran with it. I was good because I was a nurse, teaching nurses. I understood what they go through on a daily basis, because I went through it all too. I understood what I needed to teach them in order for them to be successful. I was able to relate to them, tell stories about my own nursing care, give examples and scenarios on how this new system will make *our* lives easier as nurses. It was the perfect recipe. So that whole process of going-live with the software? Yeah, that starts tomorrow. I know I am prepared because being a trainer, I know the system inside and out. However I start my journey back on the patients bedside during this whole process, my trainer/teaching time opportunity is thus far all done. So the next couple weeks/months will be stressful at best as we all cope with this very big change in my network. I am personally excited, even though I know it will be stressful. I am excited for the end result because I know the system will eventually better our patient care, give us more time with our patients instead of unnecessary charting. Just, in time. Everything good happens in time, right ? Something like that? So upcoming between my return to the unit and starting school, I will have a ton to write about! I will also need this venting space now more than ever. I don't know how I will find the time, but somehow I found the time during my Bachelors program so I can find it now too. Also in recent months, my beloved 85 year old grandma and best friend, has moved into my state! I tried for it to be the same town, but two towns over isn't too shabby either. She used to live in Long Island, New York, and on a good day it was 3 hours to go see her. On a bad day, up to 6 hours. With her increasing age and frailty, that was too long to travel on a moments notice. So the past couple months has been lots of realty and picking things out and spending time with lawyers, but best of all spending more time with my Grandma. She moved December 10th and I have been able to spend so much more time with her since. I already considered her my best friend prior, I have since I was a child- but even more so now. I am able to get to know so much more about her, and her I. The best part is with all this time spent with her, I felt inspired of all her tales about her life that I wanted to write about it all. So I'm writing a brand new, fresh start, new book. I know I've said that before, but this one feels different... It just does. For the followers that still follow, thank you from the bottom of my heart for still having interest. For any newcomers, welcome! P.S. That quote up top and the title of my post. There's a (small) story to that. As I tried to muster up the courage to come on here and write again, as I loaded the webpage, a song by Tori Kelly called "Where I belong" came on and I heard these lyrics and it was exactly what I needed to hear. Because thats exactly what I think, what I am, where I belong. I am just a girl with a story and a dream.